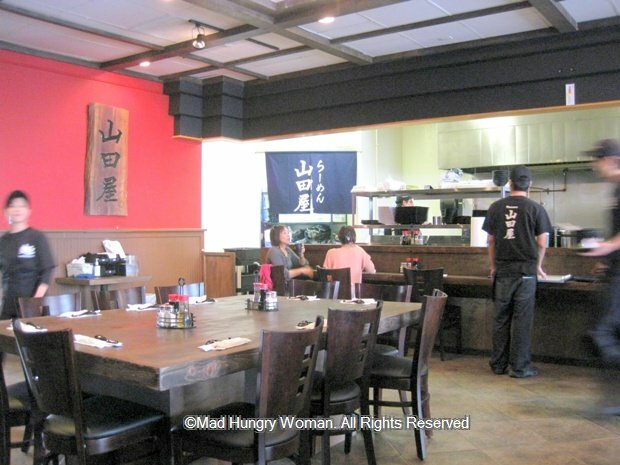 A while back, I went to Ramen Yamadaya in Gardena and fell in love with it. After all, ramen of this caliber is few and far between in Orange County, but then, who has the time to drive all the way up there for a bowl of ramen when the cravings hit? Well the answer to that is you don’t have to anymore. 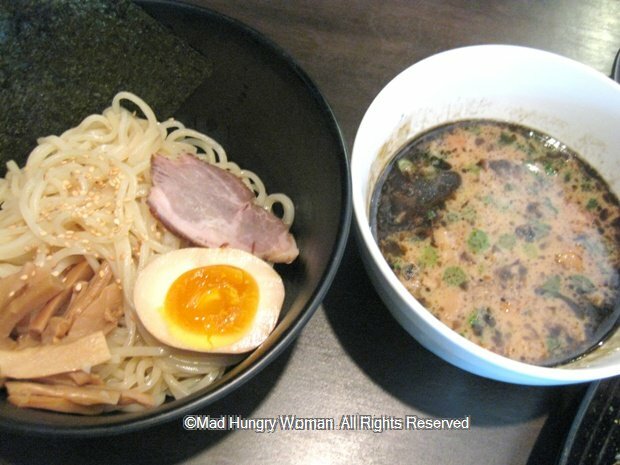 Ramen Yamadaya opened a location in Costa Mesa not long ago and I very quickly paid a few visits to see how it fared alongside its sister store. However, don’t attempt to seat yourself because you’ll be faced with someone who is cleaning the table to yell at you telling you that you have to wait to be seated. SERIOUSLY???? If you want us to wait to be seated, then PUT a sign at the doorway and we’ll do that! Don’t yell at your customer when they try to seat themselves and especially DO NOT give them the “talk to the hand” stance! 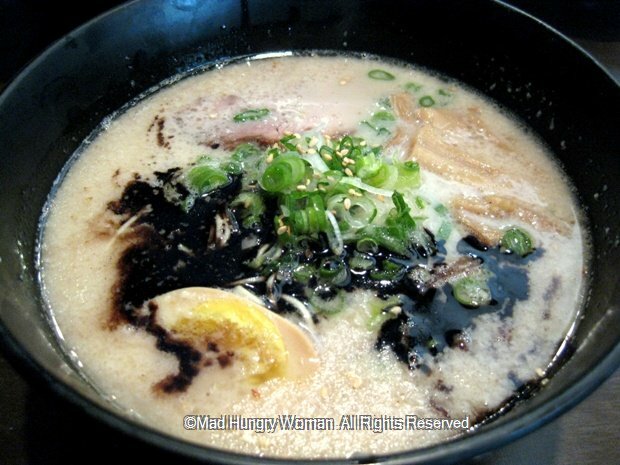 On my first trip, Tonkotsu Kotteri ($8.45) sounded so good on paper with its black garlic oil infused broth but when it arrived, the broth was so thick and somewhat greasy it made it hard to continue slurping. The thin ramen noodles were on the soft side which took away the pleasure of the chewiness I enjoy when I eat ramen. Second time around, I tried Tonkotsu Ramen ($7.95). 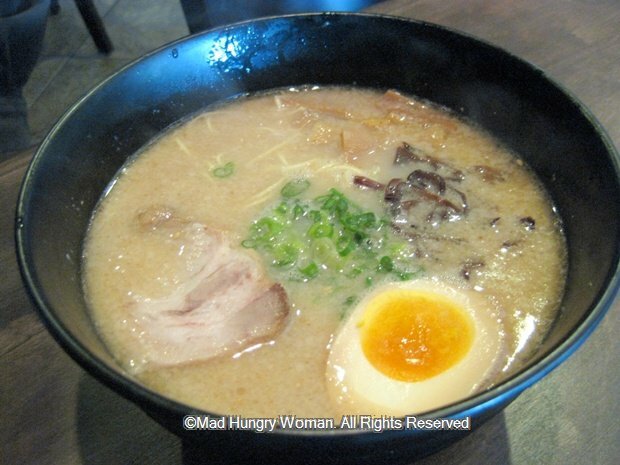 The broth is really good, rich and hearty without the heavy greasiness. Once again, the noodles were overcooked and soft. However, even though I’m not a fan of the noodles, I found the Tsukemen ($8.45/7oz) absolutely delightful. This is served, noodles in a bowl and broth in another, somewhat like zaru soba except the broth is hot and dotted with bits of pork. These noodles are different from the ramen noodles and have a really great al dente bounciness to them. Delicious! There are also different sides you can order as well as rice dishes. 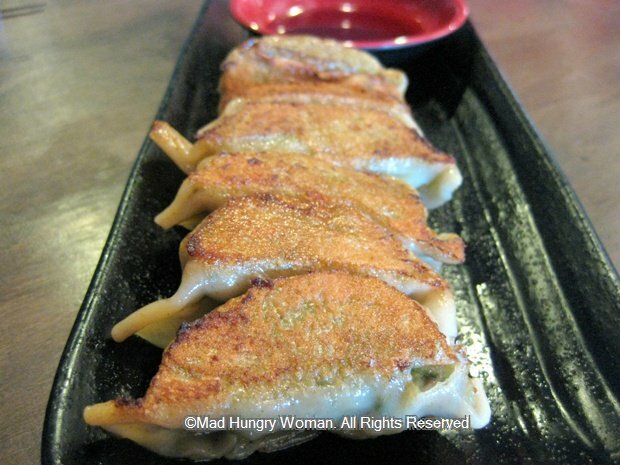 Gyoza (4.30/6pc) was so-so, the meat filling was a little mushy and the wrapper was toothy. 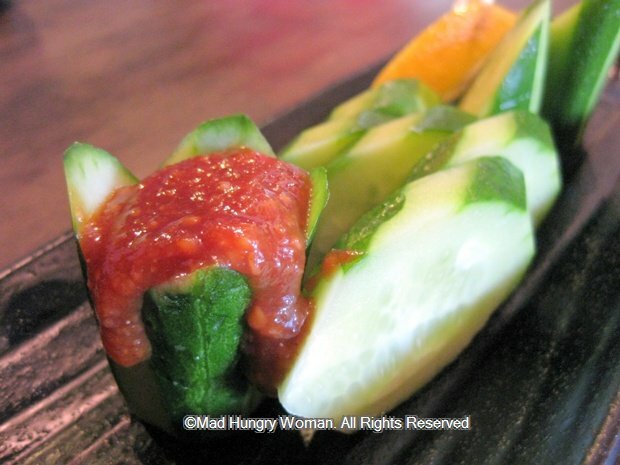 Cucumber Ippon is simple yet delicious. Sliced cucumbers are served alongside a miso dip which is sweet, salty and light. My friend, who grew up in Japan told me it was a very traditional miso and nodded with approval. 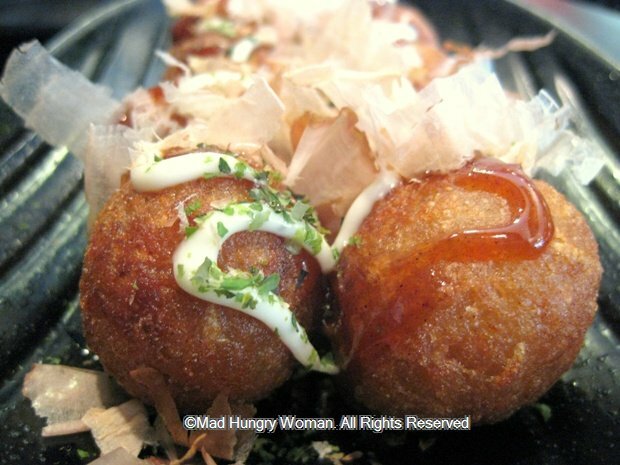 I’m not a fan of Takoyaki but my friend ordered it and I tried one. It was okay as far as takoyaki goes, but I couldn’t find much tako (octopus) in the fritter so mostly a mouthful of goo isn’t my idea of deliciousness no matter how you look at it. 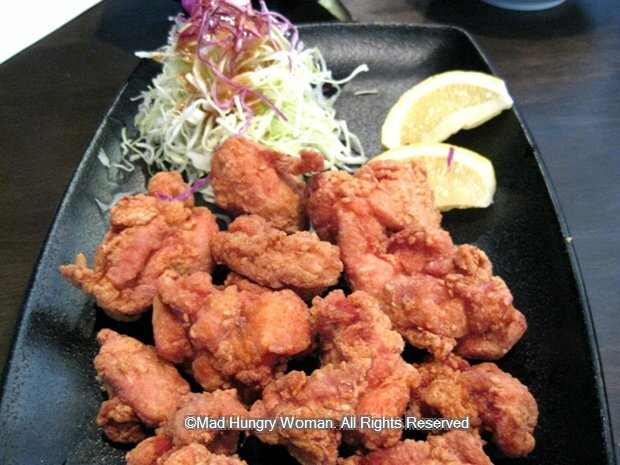 Chicken Kara-age ($5/10pc) on the other hand was the BEST fried chicken I’ve had in a long time. Each piece is perfectly crispy on the outside while retaining its moisture on the inside. I would order this with a bowl of rice if I wasn’t craving noodles every time I’ve come here, but it’s a great dish to order for the table. The Gardena store offers mayo as a dipping sauce along with the chicken but here, there is none. It’s about time a decent ramen spot joins Santouka in OC. Let’s hope more establishments decide to come on down and follow suit this year! They just have to work on the inconsistent service and way they serve things up from location to location. 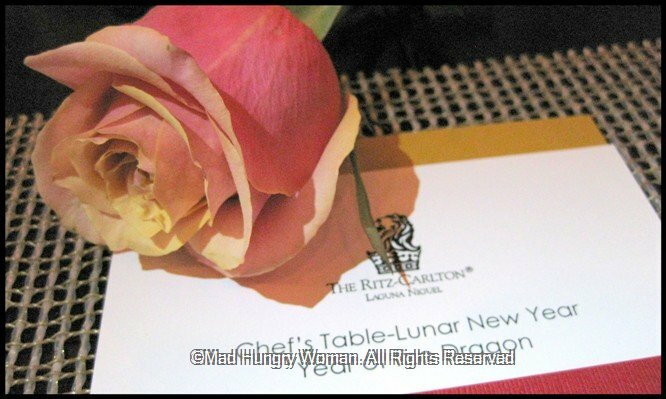 This year, food enthusiasts can revel in the monthly Chef’s Table Dinner at the Ritz-Carlton, Laguna Niguel. Executive Chef Andres Jimenez selects a seasonal theme each month, and along with chefs from his culinary team, offer a four-course tasting menu showcasing each chef’s creativity on each theme, including RAYA chef Marissa Gerlach who I’m a fan of. When you arrive, you will be directed to the private dining room, a beautifully hued space complete with its own wine ‘cellar’. I was lucky enough to be invited to the first one last week, with a theme to kick off the series in honor of Chinese New Year which incidentally, was on Monday. 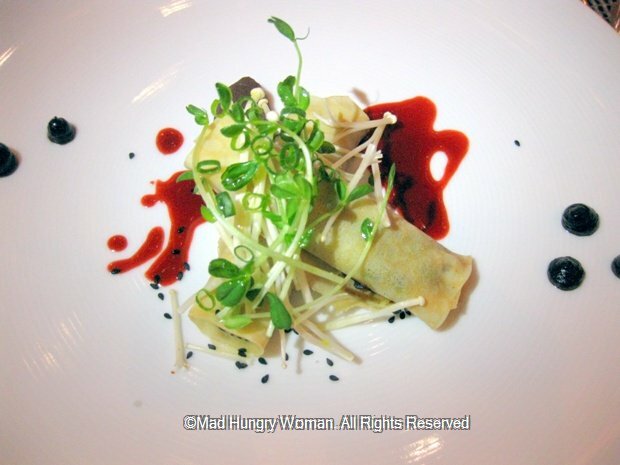 Our first course arrived with two rolled-up ‘moo shu’ packages of slightly sweet Chinese-style barbecue pork belly rolled into soft moo shu pancakes and topped with fresh pea shoots to give it a refreshingly crisp contrast. Although red bean paste is never used in savory dishes in Chinese cuisine, the quenelle of red bean paste was interesting and I ate it at the end as a palate cleanser in preparation for the next course to arrive. Fish is a vital part of a Chinese New Year meal and traditionally, we serve it whole, Here, the inspired dish was exquisitely prepared with the snapper perfectly moist and tender on the inside, while possessing a crispy exterior all over. 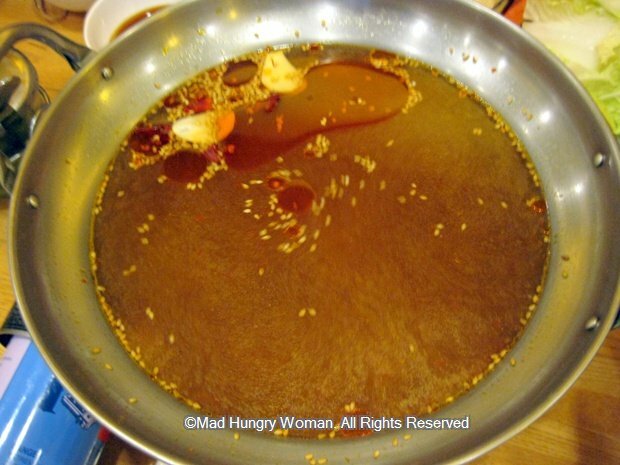 The accroutrements were reminiscent of a Sichuan-style sauce typically used on a fish dish, which played upon my senses, bringing hints of recognition here and there from my childhood. I grew up eating squab (or pigeon) and for me it is customary to order a whole one with head still intact. In Hong Kong these days, some restaurants will cut the pigeon into pieces, but always serving it “whole” along with the head. 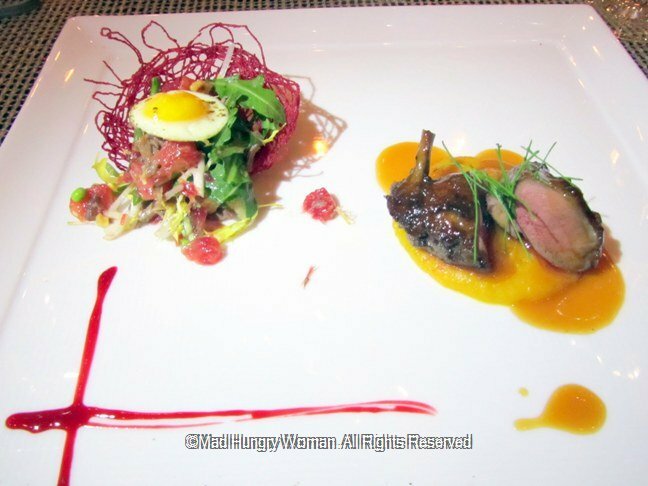 I would think if a squab was served this way, most people would have a fit and at the Ritz-Carlton, you can be sure you won’t be getting the Asian version. The delicate pieces of meat is cooked to perfection, so delicate yet firm, while the kabocha is lightly perfumed with ginger and the blood orange adds a citrusy lift should you wish for one. Then there is the ‘bird’s nest’ of finely ‘woven’ red beets spun together to form a ‘nest’ where a variety of vegetables sits with a quail egg perched on top. A mouthwatering and stunning dish, one of my top two dishes of the night. 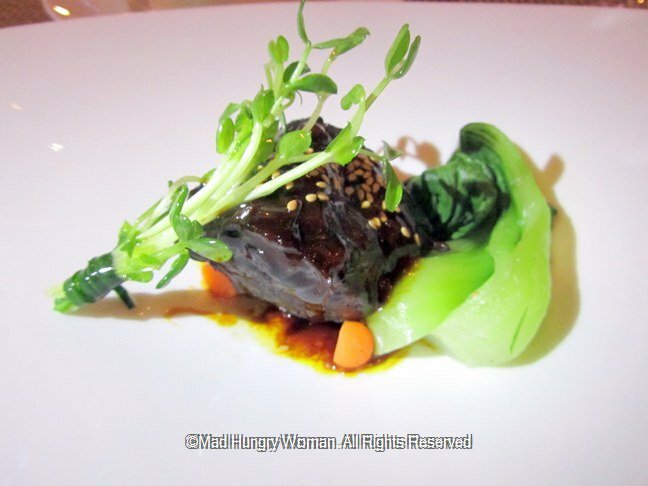 The fourth course’s presentation was so pretty I didn’t want to cut into the piece of tender short rib nestled between the baby bok choy and the baby pea shoot bouquet. I love the rich caramelized flavors of the meat which reminds me of the braised meats my mom used to make. When the last course was served, I was already full and not being a dessert fan, I always have the mentality that I can take it or leave it. 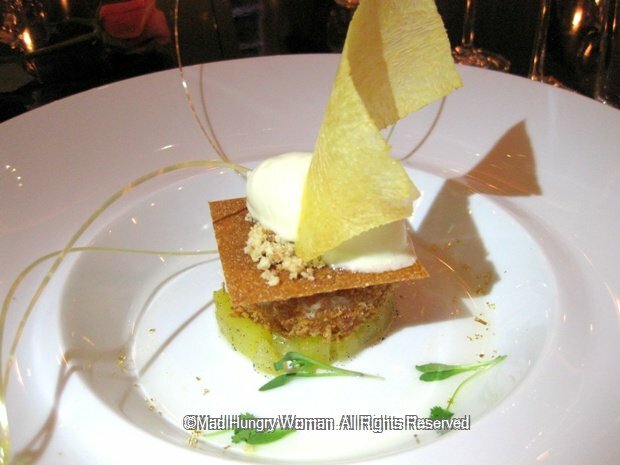 Not only was it a work of art, but after the first bite of the crispy but light rice ‘cake’ with the sweet-tart morsels of fresh pineapple, pineapple sorbet and crunchy cashew bits, I was hooked and ended up devouring its entirety. I don’t know much about wine or which wines to pair what with, however, I know what I like and all five wines served here were all very agreeable and easy-to-drink. If I drank all of them, trust me, they’re VERY easy to drink! The best part of this journey is you get to savor the talents of the chefs, get to meet them when they personally accompany the course they’ve created and hear them explain the inspiration behind the dishes. And no, it’s not because I’m special, everyone who visits a Chef’s Table dinner will receive the same experience as I did. From left: Raya Chef Marissa Gerlach, Chef Tournant Steve Wan, Banquet Chef Jim Fritz, Executive Chef Andres Jimenez and Executive Pastry Chef Brian Sundeen. 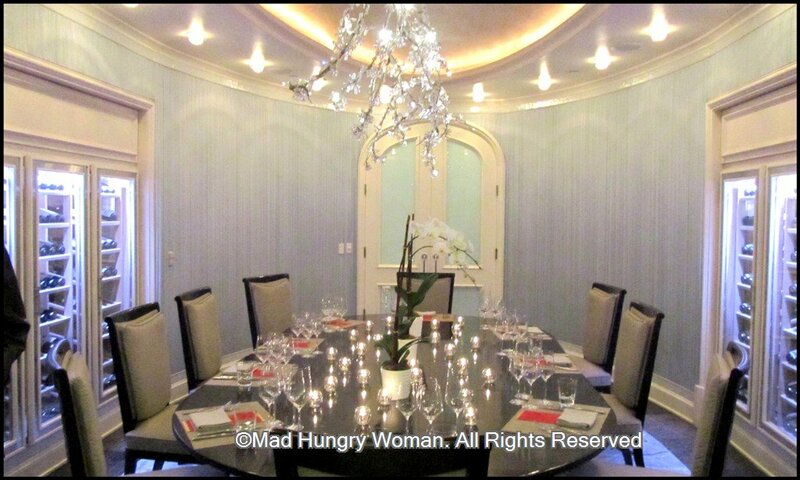 Chef’s Tables are held monthly in the resort’s Private Dining Room. The dinners start at 7pm and are $169 per person, inclusive of tax and gratuity and wine pairing. Below is the list of Chef’s Table events you can look forward to. Make your reservations early as space is very limited. Chef Jimenez showcases how ordinary ingredients found at any market can be turned into an extraordinary menu. 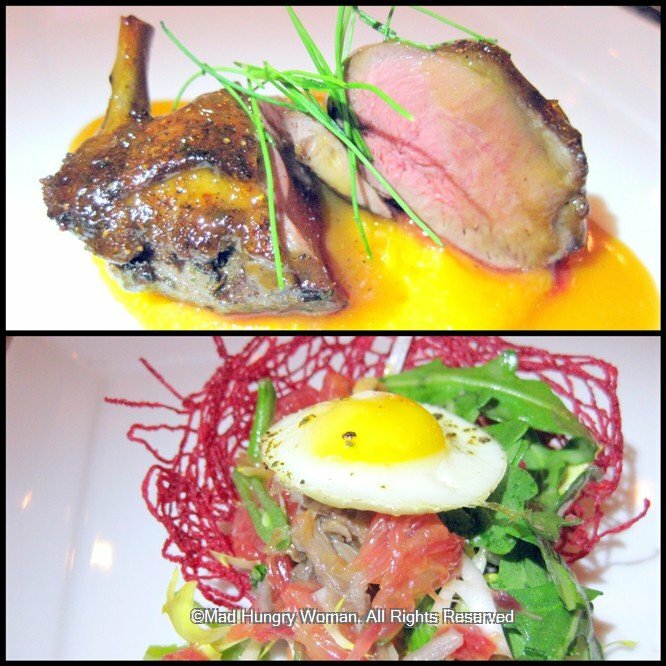 A menu utilizing only ingredients harvested, picked or raised within 250 miles of the resort. Guests will also learn about what ingredients are available within the region and how they can be turned into an amazing menu. In April, Chef Jimenez presents four wild mushrooms expertly prepared four different ways. I’m excited to see what’s in store for the dessert course! A sneak peek on the benefits of additional sunlight. Experience dishes from the year’s best season (in the Chef’s opinion) for fresh, healthy, light produce and ingredients that will tempt the palate all summer long. 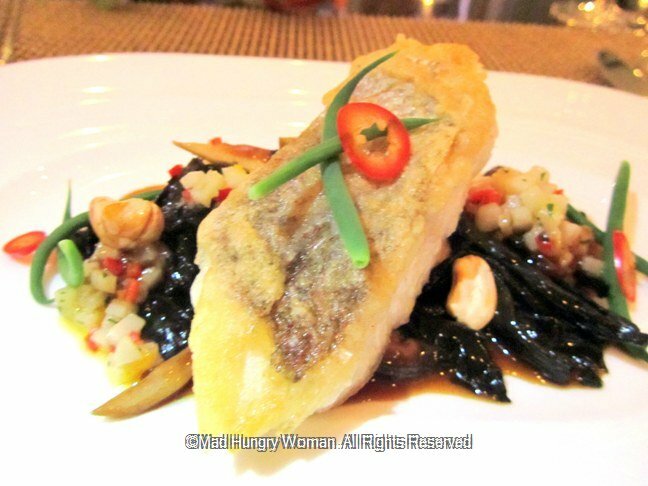 The Ritz-Carlton has generously offered dinner for two at RAYA for one lucky reader. All you have to do is tell us what is a theme you would like to see featured on the Chef’s Table and why. Please be creative and you MUST reply with your full name! Entries will close Sunday, Jan 29 and winner will be announced on Monday, Jan 30. Good Luck!! It’s Chinese New Year and traditionally, in my family, we eat hot pot. In the past, I will do this at home, but I wasn’t in the mood this year and my son was hankering for it. After a little bit of research, I realized there was nothing nearby which served the style of hot pot we like so I started asking around to see if some of my friends had some recommendations. 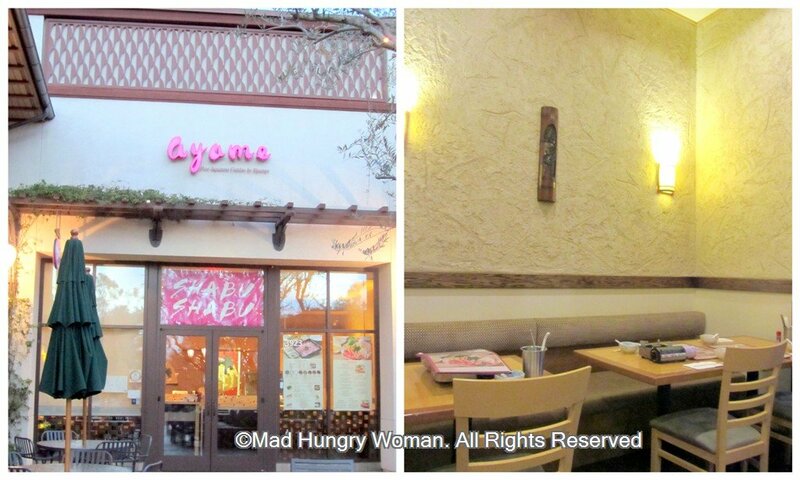 We ended up at Ayame, a surprisingly small restaurant in — wouldn’t you know it — an Irvine Company strip mall. What is unique about this place is the variety of broths available for you to cook your food in. Generally, one type of broth is offered and that’s it. With a variety of broths, everyone can have his or her own selection to cook with. Spicy miso is savory and has only a light hint of miso and turned out to be our favorite all around. 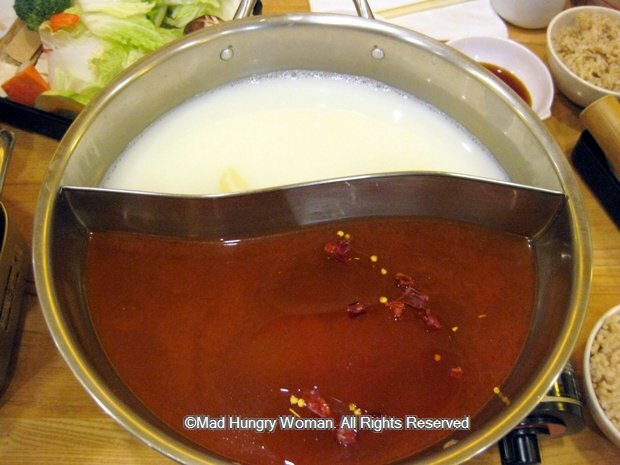 The other pot has a divider — a yin yang pot — and we chose Asian spicy and soy milk for that option. Depending on how much you want to eat, combos are the best way to go, on top of your protein selection, you get a bowl of rice — white or brown — and a plate of assorted vegetables. After you select your broth, choose your protein and there are several ways to do this, there is regular, large and lunch prices. 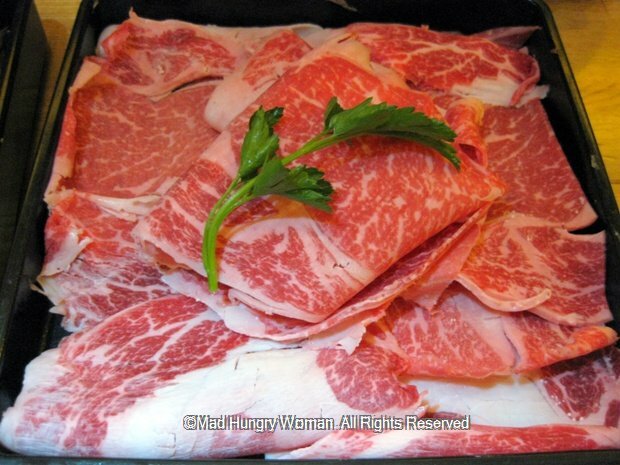 Kobe beef ($35.95/combo large) is the top grade of beef offered. 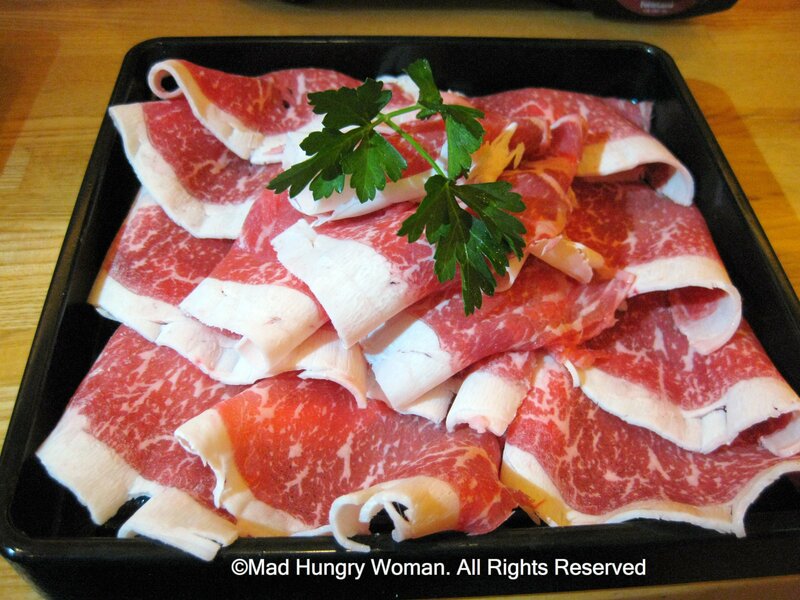 There is even marbling all around and although the meat is slice a tad too thick, it was very flavorful and tender. Prime Rib Eye ($23.95/combo large) is a stellar cut and I thought, the best deal for what you pay. The meat is tasty with a good meaty flavor. If meat is not your thing, then Seafood ($17.95/regular combo) is a respectable choice. 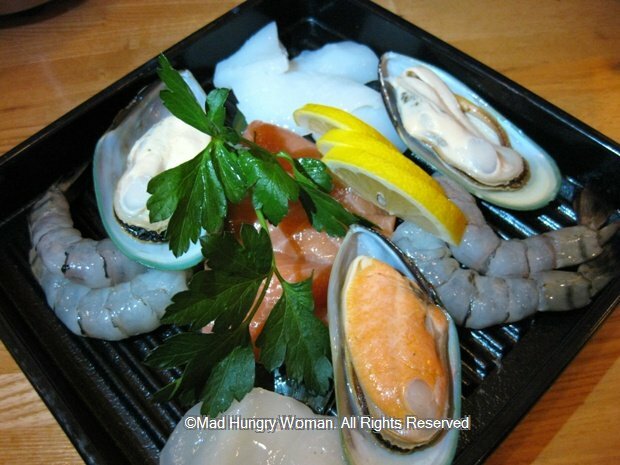 The plate includes green lip mussels, scallops, shrimps, squid and salmon. The pots are promptly brought out to the table and place on top of the gas burners. The tables are really small and this was when it hit me that there was no room to maneuver at all. 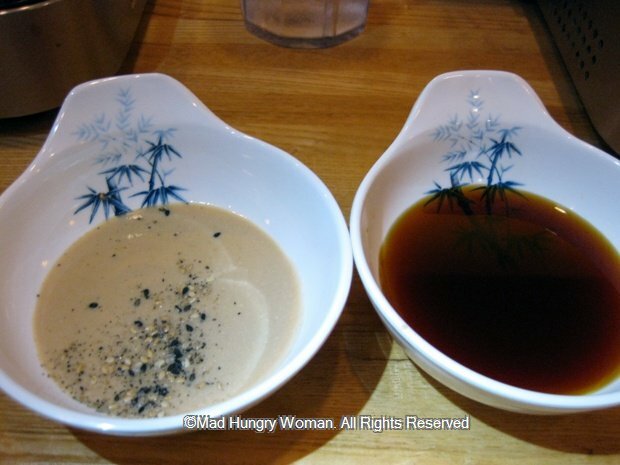 Two types of sauces are provided — sesame sauce and ponzu — along with grated daikon, scallions and garlic, which you can add to your sauces if you choose to do so. I like a lot of daikon in my ponzu! 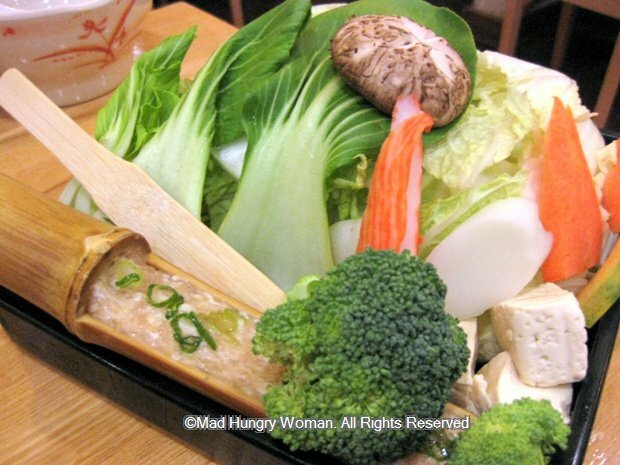 The vegetable plate were broccoli florets, baby bok choy, napa cabbage, carrot, shiitake mushroom, imitation crab, and a hollowed out bamboo filled with a ground chicken paste you can make meatballs with and drop them into the broth. The soy milk broth was unique and I liked how it made the meat taste — but if you are going to dip it into the ponzu or sesame anyway it really doesn’t matter what broth you get because you’re going to mask the taste of the meat anyway. If you like it au naturel, then the soy milk flavor comes through and enhances the meat. This is one of the better ‘shabu’ places close to home. It is also pricier than the other shabu places around. An extra order of prime rib eye will set you back $9.95 while Kobe beef is $17.95. I don’t mind paying when the food quality is good, but it irks me when an automatic18% gratuity is added to my bill when there are only three of us. Lunar New Year of the Dragon 2012 is on Monday, January 23 and several restaurants around town are honoring this occasion with specially created menus symbolic of what Chinese New Year means to those of us who celebrate it. AnQi at South Coast Plaza is offering a 5-course prix fixe (or a la carte) menu designed with the principles of feng shui in mind. I sampled a few of the items featured on the prix fixe — mind you, these are tasting sizes and may not be proportionate to what you receive. Since 2012 is the year of the water dragon, it is only fitting that the first dish, Dragon Food — crispy salt and pepper lobster tail — starts your meal. 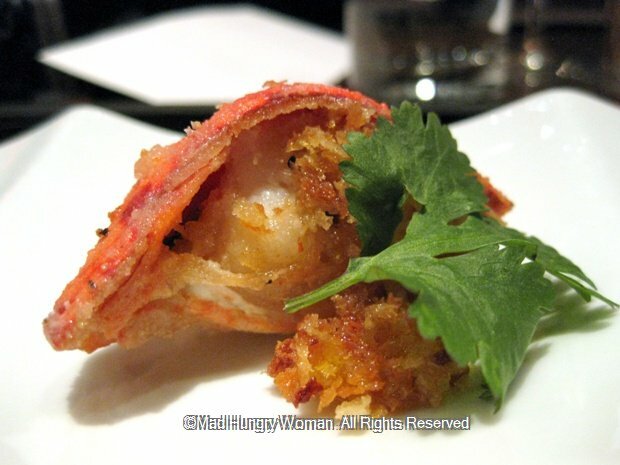 Lobster is a symbolic “dragon food” and here, the crustacean is tender with hints of citrus and truffle. 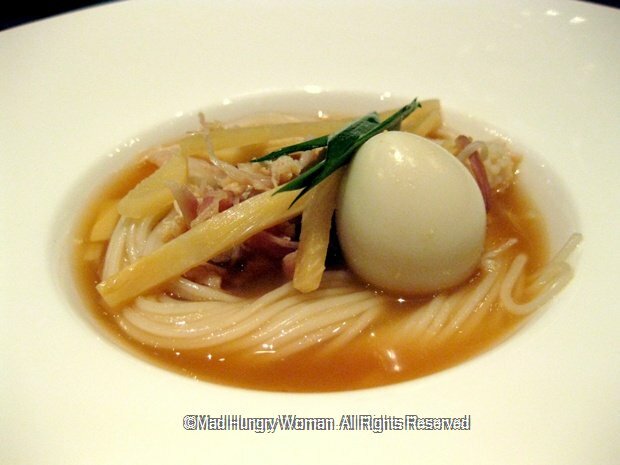 From The Sky — long life somen noodles with shredded bamboo and quail egg in a garlic chives and broth — represents health and longevity. Noodles are used a lot in Chinese culture especially to celebrate birthdays and here, it signifies long lasting health for the year. From The Earth — five spice butter roasted game hen, wok tossed garlic Asian greens, baby radish and crispy prawn cracker is different to the sampler we received, however, chicken is readily used during Chinese New Year to bring you a year of richness and abundance. 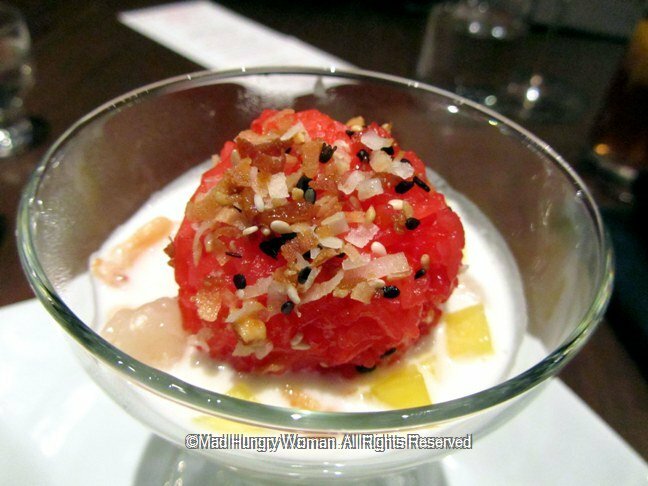 Finish off with Sticky Red Rice, Tangerine Custard and Lychee — a subtly sweet dessert with the lucky ‘red’ evident in any true celebratory event in my culture. I enjoyed this very much. Chinese New Year prix fixe and a la carte menus are available until Monday, January 23rd. I can tell you the exact date I last went to PF Chang’s — June 19th, 2003. It was my first and last time. 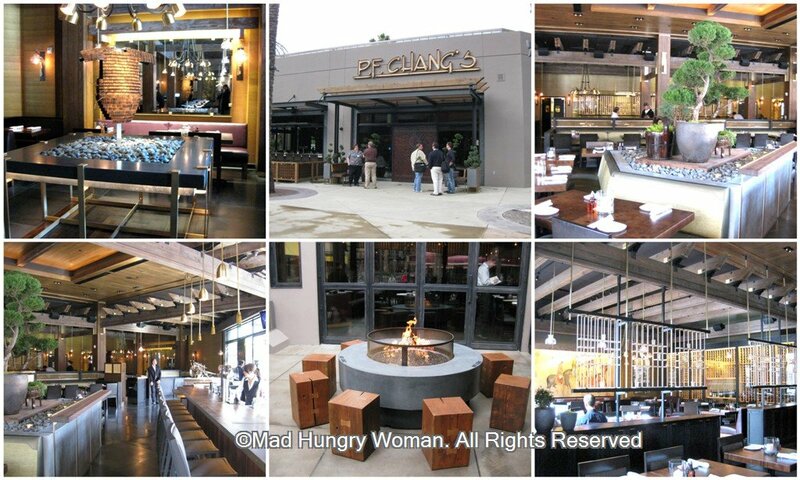 So last month, when I was invited to the media preview of the re-launch of PF Chang’s at Irvine Spectrum, I arrived with major skepticism, remembering the meal I experienced almost a decade ago. 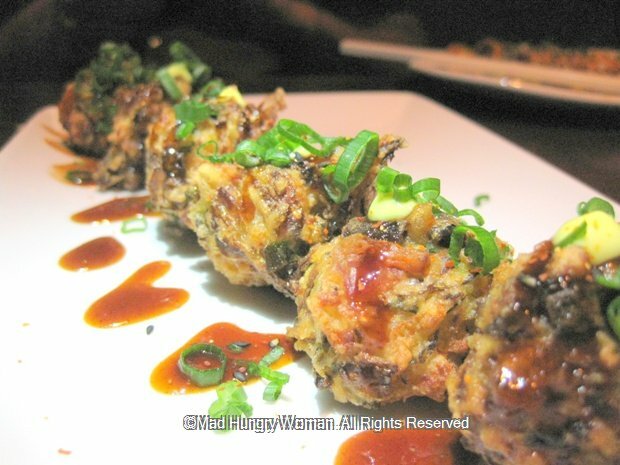 We were introduced to new menu items which were surprisingly pleasing and changed my outlook at the whole PF Chang’s brand. Just to make sure that my post was justified, I returned again this week. I didn’t want the media preview to be a fluke. If I was to shower PF Chang’s with new-found praise, I wanted to make sure it was deservedly so. I always suggest dining with friends — at least 3 of them — because meals are meant to be shared. 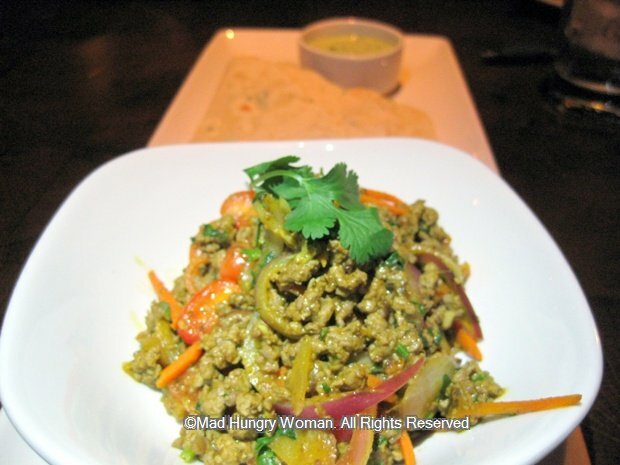 Start with Kashmir Wok-Seared Lamb ($9.95) a mound of ground lamb, carrots, red onions and Baltic Masala Spice served with scallion pancakes and a Thai-basil cucumber raita dipping sauce. 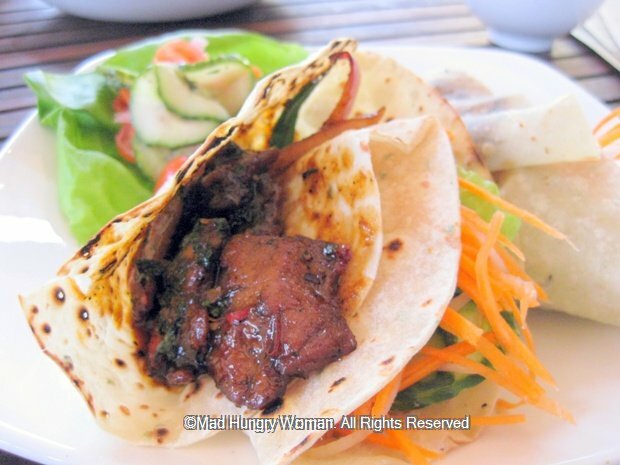 Although the pancakes were a little on the thick side, the lamb was flavorful and not very spicy. Rice would’ve made a great accompaniment if the pancakes were not to your liking. Wok-Charred Volcano Steak Pockets ($8.95) is offered on the lunch menu and served in a thin scallion pancake (which would’ve been great with the lamb by the way) wrapped with the steak on one side and a version of do chua (Vietnamese pickled daikon and carrots) stuffed on the other side along with lettuce and cilantro. One of the items we were introduced to at the preview was Sizzling Black Iron Mussels ($10.95). 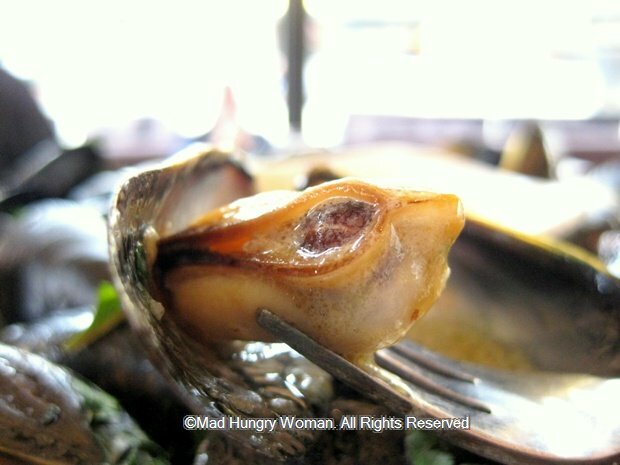 I’m extremely fussy about mussels and this dish blew me away the first time and I wanted to try it again. Let me just say, the second time around was just as good. The mussels arrive on a sizzling plate atop a concoction of sliced chilis, ginger and garlic and served with a black bean butter dipping sauce. 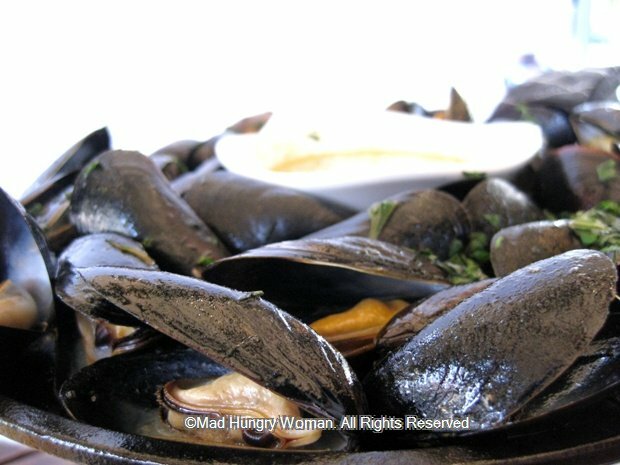 The mussels are tender and the sauce has just a little tartness to enhance these delicious mollusks. Honestly, this dish is a hard one to share because I want it all to myself, together with one of their signature cocktails………. 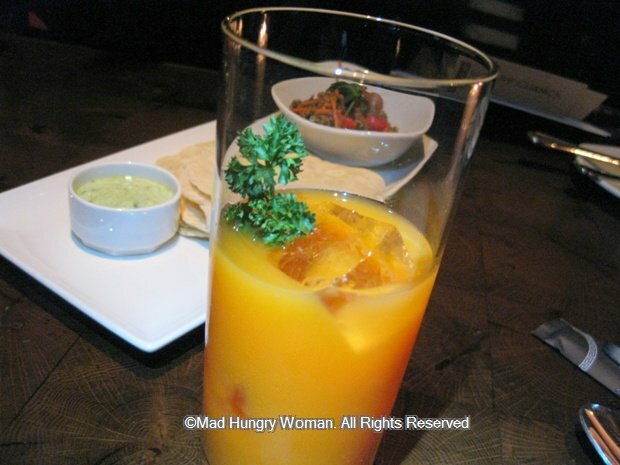 …….. namely the Carrot Canton ($9). This outstanding drink has the sweetness of fresh carrot juice and Domaine de Canton Liqueur. It tasted more like something you’d get at a health spa, but with a splash of alcohol. I didn’t particularly care for Shrimp and Bacon Okonomiyaki ($6.45), but then again, I don’t like okonomiyaki to begin with so either way, it wouldn’t have won with me — sorry. 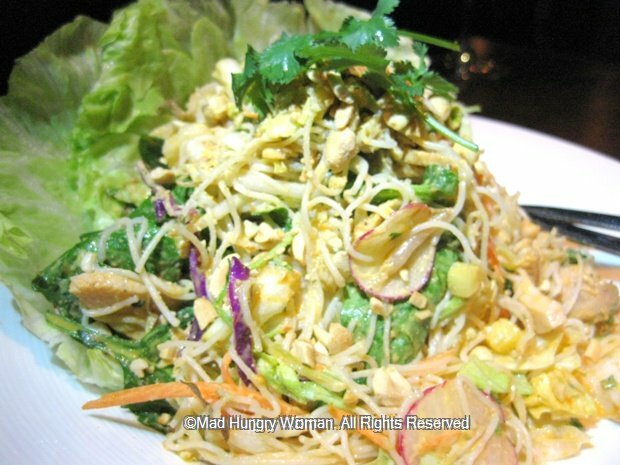 Thai Noodle Chicken Salad ($9.95) was also a new addition, which would’ve been really great if there was more acid. I added a splash of vinegar which did the trick, but some fresh lime wedges would be the key to give this dish what it desperately needed. 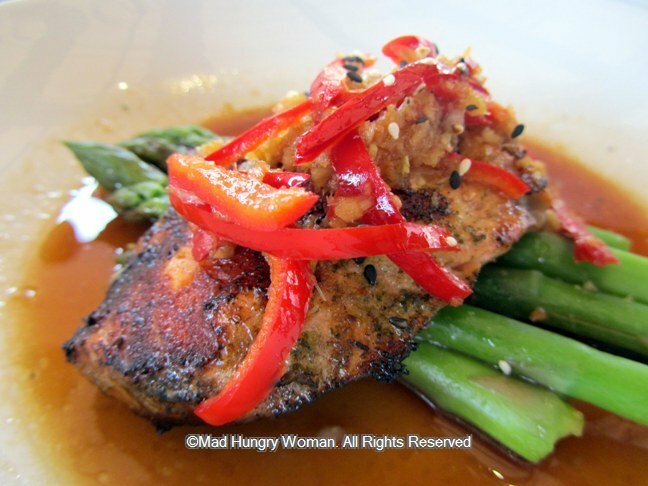 Our server suggested the Lemongrass Grilled Norwegian Salmon ($12.95) which he informs us was one of the popular items on the lunch menu. It was a very good lunch time choice if you are wanting a light lunch, served with asparagus and red peppers accompanying. I didn’t detect any lemongrass although ginger was clearly evident. 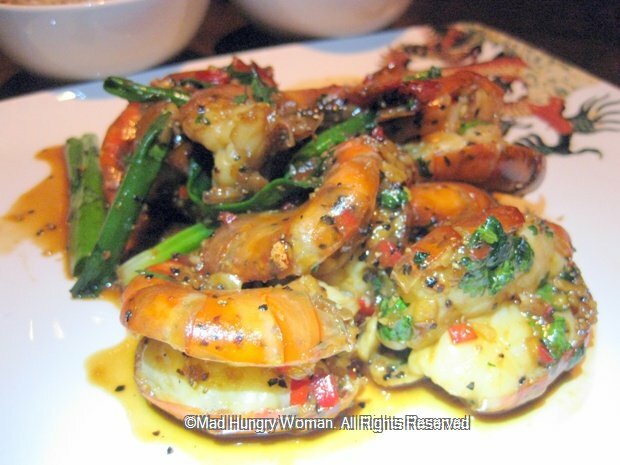 Singaporean Black Pepper Prawns ($21.95) is another dish I recommend. These sweet water prawns are plump and tossed in a heavier sauce than its Singaporean counterpart — when you eat it in Singapore. Unfortunately, it is only offered on the dinner menu, but is perfect with rice — brown or white are both available and is always complimentary! I highly recommend ending your meal with Passion Fruit Tart ($6.45). 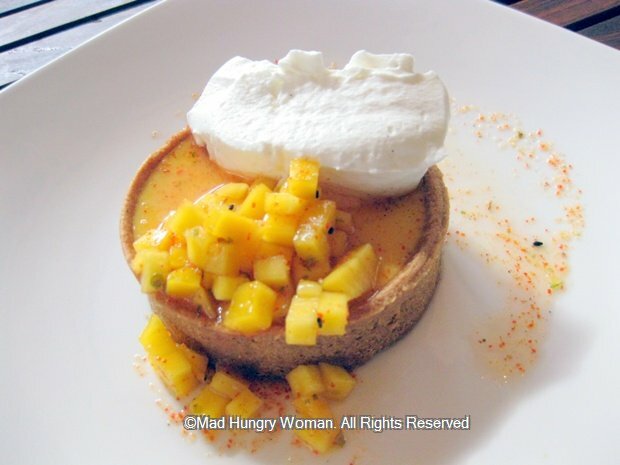 You all know I’m not a fan of desserts, but the passion fruit presented a lovely tart finish and the graham cracker crust was texturally pleasing. Diced fresh mangoes added a refreshing component and the surprising use of togarashi added a kick to the vanilla glaze. Dining on the patio is just lovely even though the dining room is equally amazing. PF Chang’s has changed my viewpoint and won me over with its new menu. I am happy to return for cocktails and dine on some mussels and shrimp, knowing I will leave very satisfied with a smile on my face. And those of you who are fans, or need to be won over, PF Chang’s has generously offered my readers two $25 giftcards. Please leave me a comment and tell me if you are a fan, or someone who still needs to be won over and most importantly, WHY? You have until Sunday, Jan 22nd to enter. Winners will be announced Monday Jan 23rd. It’s only been a few weeks into the new year and this is my second post on a first experience. 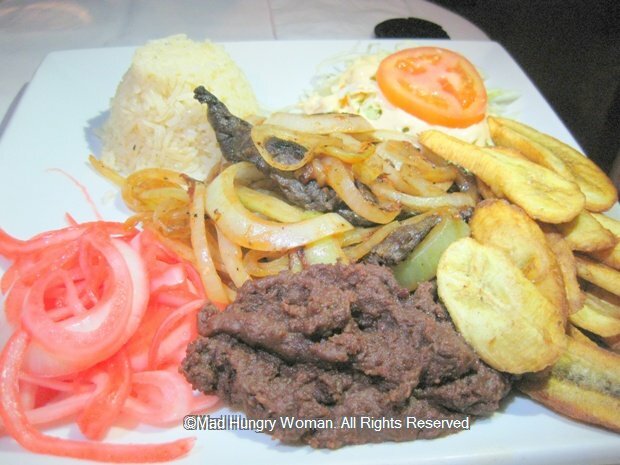 First was Kenyan cuisine, and now, it’s Honduran. Sure, I’ve had many south American encounters, but Honduran is new for me. After a recent Yelp elite event, a bunch of us stopped by this place to grab a bite to eat. It was already late and the restaurant was 30 minutes to closing, but nevertheless, they accommodated us with open arms and smiles. 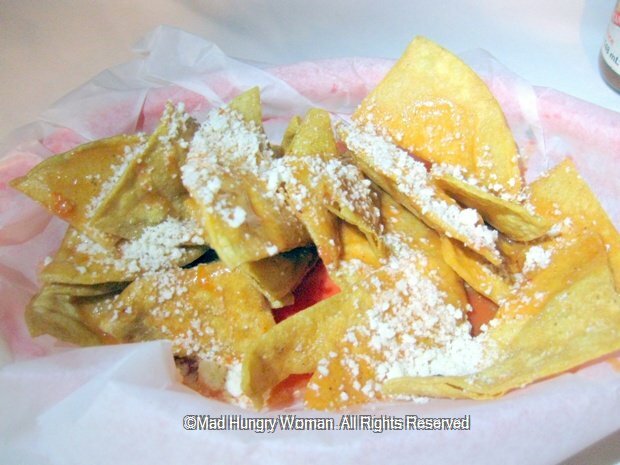 We were brought tortilla chips doused with a red sauce and sprinkled with cheese while we perused the menu. I liked that they put some effort into it instead of just a basket of chips with salsa which is usually the norm. After a long discussion between us and the server, we decided upon some things to start before moving on to our entrees. Ceviche de Caracol ($14.99) is a Honduran specialty. 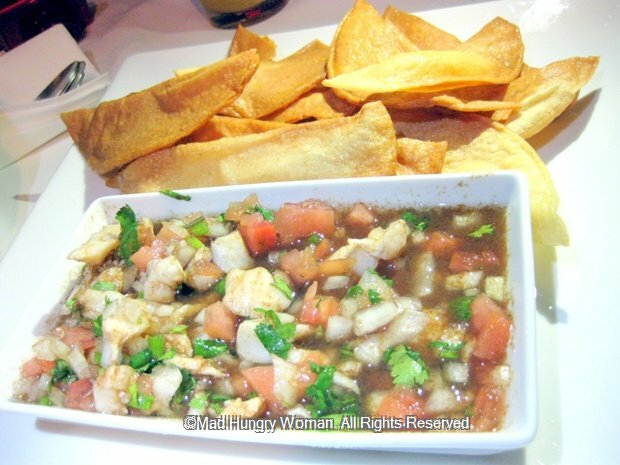 Chunks of conch is marinated in lemon juice, celery, cilantro, tomato, onion and spices with homemade chips served alongside. 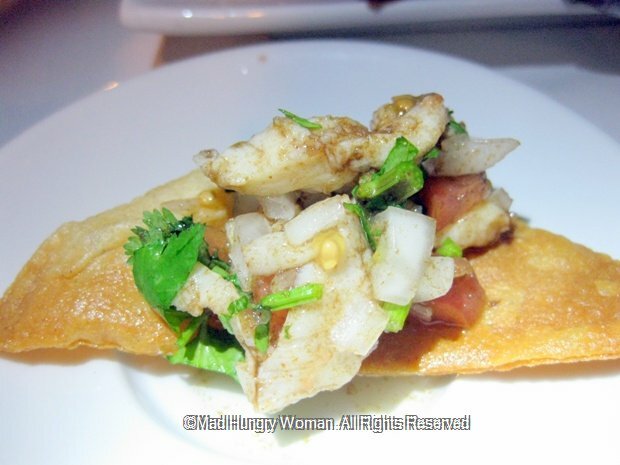 I love conch with its chewy texture and here, the tart marinade made it mouth-puckering good. Best way to eat it is to scoop some on top of a tortilla chip and combine all the textures together in one mouthful! DEEEELICIOUS! We didn’t have intentions to order the Baleadas ($10 for six), but the server described them to us and we were sold. 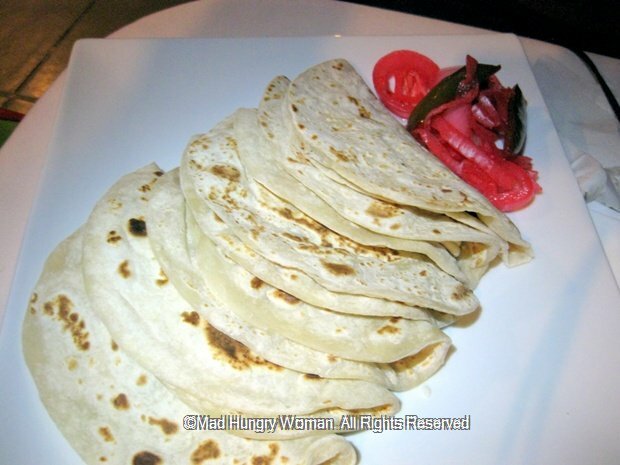 These hand made flour tortillas are filled with refried beans, dry cheese similar to cotija and mantequilla described as “Honduran cream” on the menu. It tasted like crema although mantequilla is the word for butter in Spanish. I think Austin ate about four of these on his own. 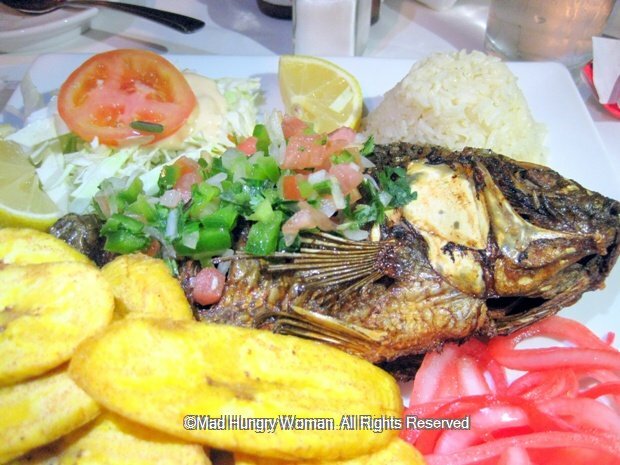 I’m a huge fan of fried fish so when I saw Pescado Frito ($12.99) fried tilapia seasoned with spices and lemon, I knew I had to order it. Unfortunately, the fish arrived very dry and flavorless even after squeezing half a lemon all over it. Austin’s Bisteak Encebollado ($9.99), a grilled steak topped with onions, was decent, not the best I’ve ever had, but it was well seasoned and satiated our tastebuds. 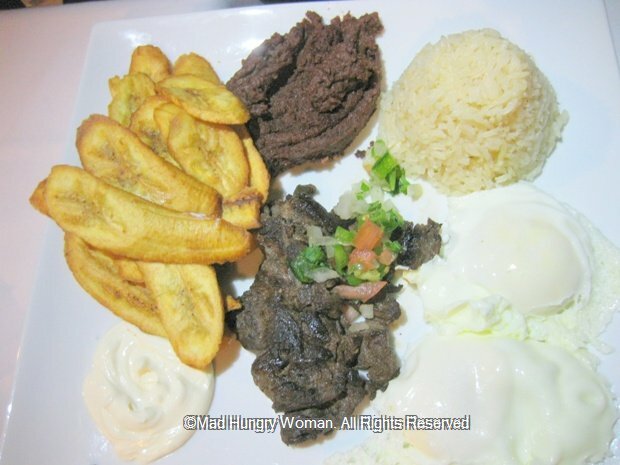 Three of my friends ordered Desayuno Carne Desebrada ($6.99), a dish of shredded beef scrambled with eggs and Honduran cream, cheese and served with beans and tajadas (plantains). The only problem was, it didn’t taste different to the bisteak encebollado. Some other friends showed up half way into our meal and I also tried some of their Arroz con Pollo ($9.99) which was very good! 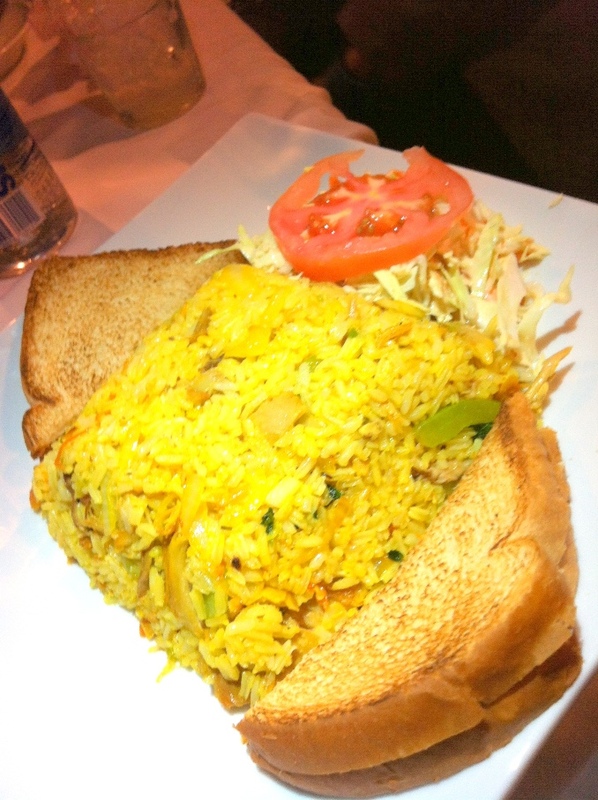 The rice is nicely infused with lots of flavor and I wish we had ordered this instead. We stayed until late and the staff were so accommodating. We were grateful for their warm hospitality and service. 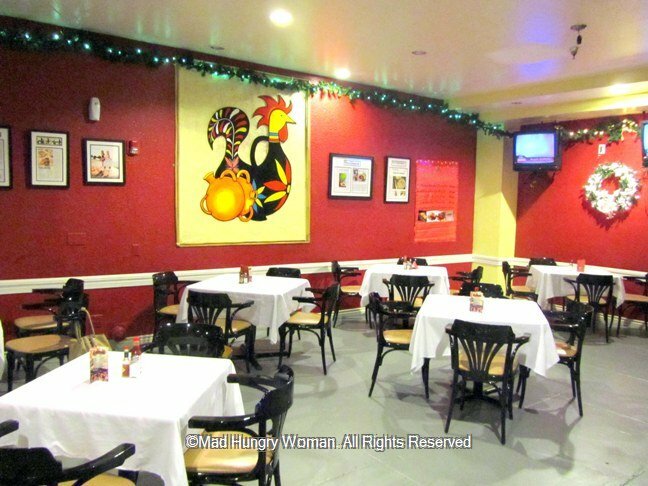 Some arroz con pollo would be really nice right about now.